Since around 42% of B2C companies have decided to invest more money in content marketing, it’s safe to say that it’s important. Content marketing has been around for a while. It’s an easy way to boost branding, educate customers, and draw your audience down your sales funnel. Keeping up engagement that leads to conversion is a struggle. Trends change all the time, and what works one month might not work the next. Creating engaging content is difficult enough. Now you’ve got to do research on how to effectively use it to generate leads. We feel your pain and are here to help. In this article we’re going to go over popular kinds of content, building detailed customer personas, and other ideas to help you navigate the world of effective content creation. Trends like these are vital to your success in 2019. Keep reading to learn how to build a content marketing funnel that gets results! Not sure what exactly counts as content marketing? Let’s break down the basics before we tackle the trends. Before, getting your product or ads out there wasn’t as precise. With our hyper-connected, data-infused world, you can find your audience, craft content around their needs, and get it into their hands at the push of a button. When you create a piece of content, like a blog post or a video, you want to get it into your customers’ — and potential customers’ — hands in the most effective way possible. The strategy that you employ to make sure your content remains relevant and gets seen by the right people is the foundation of content marketing. Next, let’s look at the basic sales funnel and how content marketing fits into your sales strategy. Understanding a basic sales funnel is a major step towards generating and distributing your content in an efficient way. Content marketing fits into each piece of the sales funnel. Using the latest content marketing trends, you can find the perfect place to put content in and move your customers towards the final sale. 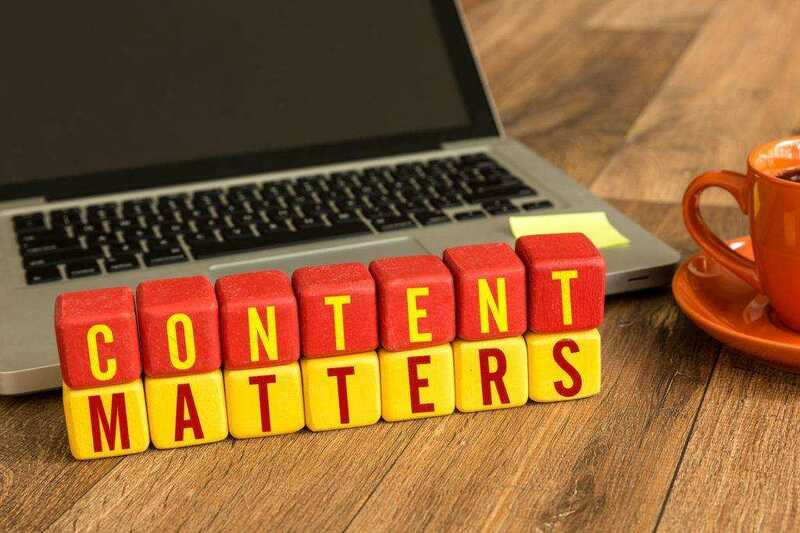 Now that you understand the basics of content marketing and its role in your sales funnel, let’s move on to the best content marketing trends to look out for in 2019. Too many times businesses focus on what they need (hitting certain sales numbers, for example) and not on what their customers want. Less than half of businesses engage with their customers to find out what they need. Not only do we have access to customer data through third parties, but many customers willingly give it up. Taking this raw material and discovering what trends emerge from the information is crucial to understanding your customers. Tailoring content to things your audience cares about establishes your authority in your field. Plus it draws in the people that are more likely to convert. Use whatever data you have available and start crafting audience personas. If all else fails, engage the people consuming your content and ask them what they want to see. So you know your customer inside and out. You’ve created content that brings them in regularly. They come, they see, they buy. Are you just going to let them fall out of the funnel? Before, we said that tailoring content establishes you as an authority in your field. In this next part, we want you to establish authenticity. It’s a little bit trickier than crafting an ad. You have to be warm and genuine. Once the sale is over, your opportunity for content marketing doesn’t end. Send them a follow-up email discussing their experience and use this opportunity to point them to other things they might like. Be a real person instead of using a basic form to follow up. Did your customer have a bad experience shopping with you? Treat that as an opportunity to address their needs and turn their experience around. Being a real human online at all hours is taxing if you’re a team of one. If you hire more employees to tackle inquiries at all hours, it can be costly. Have you considered using a chatbot? This is a simple solution to many customer service issues and another opportunity for content marketing. Chatbots and autoresponders make every trend watch list for a good reason. It’s predicted that by 2020, chatbots will take over around 85% of customer service interactions. You can direct customer inquiries and comments to the appropriate department with a chatbot. Autoresponders can send content directly to customers depending on how they meet different criteria, such as making a purchase. Bonus: having chatbots handle things frees up more time to create other content! While blogs are still the most commonly produced content around, video content is gaining on it, and fast. By recognizing how much potential video has right now, you’re poised to take advantage of this powerful content trend. Making videos can seem daunting. You need to get over whatever reservations you have if you want to stay relevant, though. Videos put a face on your business in a way that blog posts can’t. Plus, they can be distributed in so many different ways, like embedded in a blog post or in an email. Not sure where to start with videos? Use your blog posts that you’ve already written as a guideline for your video content marketing. Remember to stick to a consistent posting schedule once you start and make your videos mobile-friendly. While video is increasing in popularity every day, that’s not to say blog posts are dead. The trend for content marketing with blogs has shifted toward long-form articles. Before, a blog post could shoot to the top of a search results page with just 25 to 500 words and a few great pictures. Now, much meatier content is what’s working best. What’s the word count you should be aiming for? Stick to the range of 1,500 to 2,000 words for best results. There are a few reasons why this content marketing trend is so effective. First, a long-form article has better SEO. You’ll be easily discovered during customers’ online searches. Second, articles that have a lot of information offer a lot of value to your customers. In return, this leads to them being shared on social media, the modern-day equivalent of word-of-mouth advertising. Keep in mind the emphasis of offering value to your customers. Don’t stuff long-form articles with mindless fluff. Good old fashioned Googling is still the main way people search for things online. However, there is a challenger on the horizon — voice search. You’ve probably used the virtual assistant (think: Siri, Cortana) on your phone. Maybe you have one of those smart speakers in your house, like Echo or Alexa. Devices like these are reshaping the way that we search for things. Ultimately, they will reshape how customers discover your content. Instant gratification: your customers want answers and they want them now. Pack relevant information into your content. Keep it conversational: typed queries are more formal than spoken ones. Use conversational words in your content to rank higher. Local results: many voice search users are looking for things nearby. Using your location’s name, like a town or street, and phrases like “near me” helps. Bonus: do some regular and voice searches for your own product, service, and/or company. Use what comes up as a foundation for your content. So you’ve got a lot of great content. It’s optimized for voice search and you know it’s what your customers are looking for. Do you know how to get it to them? Here’s where understanding your audience comes into play. When you’re building audience personas to determine what they want from your content, see what their preferred method of delivery is, too. For example, if your demographics skew older, you might want to go with Facebook ads or email newsletters. Younger audiences gravitate to platforms like YouTube and Snapchat. Passive distribution is a thing of the past. You need to focus on engagement to stay relevant and making your customer feel like an afterthought is a great way to lose it. Creating a distribution strategy can be daunting and frustrating. You really need to be enthusiastic and do your homework. The payoff, however, is well worth it. Put in some elbow grease and you’ll yield big returns from this content marketing trend. Social media isn’t going anywhere. If your business is one of the few stragglers not on these powerful platforms, you’ll want to remedy that as soon as possible. Social media is essentially free advertising. Better yet, your customers choose to engage with you, not just passively hear an ad on the radio or see it on TV. These are your quality customers, the ones that have sought you out and want to talk to you. It’s pure content marketing gold! Remember what we said about the importance of the right distribution? Social media is a big part of this content marketing strategy. Do your research to find the platform that yields the highest ROI. Start with the basics, like Facebook or Twitter, and then try others that might work better for your particular demographic, like LinkedIn and Pinterest. Bonus: social media is a big part of creating an authentic customer relationship too. Listen to what your customers say on your sites and make sure you acknowledge every comment, even the bad ones. Perhaps you want to outsource your content to someone who can boost engagement. You might want to tap an influencer for content creation. Influencers are new to the marketing scene, but they’ve proven to be powerful. Think about Kim Kardashian selling diet teas on her Instagram, or the many YouTube celebrities with cult followings. Is there someone like that in your line of work? You can work out an agreement for them to create custom content for your pages. These few suggestions will get you started. This is an opportunity for your brand to be fun, creative, and extremely relevant. No matter if you plan on focusing on one content marketing trend or using all of them, you won’t get anywhere without a solid strategy. Your content shouldn’t be a “one size fits all” solution. You need to sit down and establish what kind of goals you want to meet with whatever content you create. Then, with these trends in mind, work out the best plan of action to achieve them. You can’t go wrong with a foundation of quality content, exceptional customer service, solid SEO, and creativity. At the end of this list, you’ve got a lot of things to consider moving forward. No doubt you’re excited to start crafting the ultimate strategy using this knowledge of the latest content marketing trends. Need some help achieving your content goals? That’s why we’re here. We offer blogging, video, local SEO, reputation management, and more that utilizes trends like these to get maximum results. Reach out to us today and discover all we offer!